(in Wansong's Preface) Qu Yuan (ca 340-278 BCE): poet and minister whose verses included the lines: "All the world is muddied with confusion;/ I alone am pure./ People all are drunk;/ I alone am sober." Qu Yuan says, “Only I am sober” – this is nothing but intoxication. Yangshan speaks of a dream; yet it is like in an awakened state. Just tell me, is this an awakened state or is this a dream? Master Yangshan went to Maitreya's abode in a dream and was led to the third [GG] second [BOS] seat. When Yangshan had said this, all the monks dispersed. Yangshan awoke from the dream, and went to tell Guishan about it. Guishan said, "You have now reached the holy rank." At this, Yangshan made a bow. See also: BOS15, and BOS37. Yangshan went with Guishan to the fields to help him with plowing. He said, "How is it that this side is so low and the other side is so high?" Guishan said, "Water can level all things; let the water be the leveler." Yangshan said, "Water is not reliable. It is just that the high places are high and the low places are low." Guishan said, "Oh, that's true." One day when they were picking tea, Guishan called to Yangshan, "All day I have heard your voice but have not seen your face." Yangshan, not saying anything, shook a tea plant. Guishan said, "You have got the function but not the essence." "So what would you say?" asked Yangshan. Then Yangshan told him, "You have the essence but not the function." Guishan asked Yangshan, "In the forty volumes of the Nirvana Sutra, how many words were spoken by Buddha and how many by the devils?" Yangshan replied, "They are all devils' words." Guishan said, "From now on no one will be able to do anything to you." When Guishan was in bed, Yangshan came to speak to him, but the master turned his face to the wall. Yangshan asked, "How can you do this?" The master rose and stated, "A moment ago I had a dream. Won't you interpret it for me?" Thereupon Yangshan brought in a basin of water for the master to wash his face. A little later Xiangyan also appeared to speak to the master. The master repeated, "I have just had a dream. Yangshan interpreted it. Now it is your turn." Xiangyan brought in a cup of tea. The master said, "The insight of both of you excels that of Shariputra." Guishan sent Yangshan a mirror, and during a teisho Yangshan asked: "Is this Guishan's mirror or mine? If you say it is mine, did it not come from Guishan? If you say it is Guishan's, am I not now holding it? If you can say a word of Zen I will keep the mirror, if not I will break it." A magician flew in from India one day. Yangshan asked him, "When did you leave India?" The magician said, "This morning." Yangshan said, "What took you so long?" The magician said, "Oh, I went sight seeing here and there on the way." Yangshan said, "You obviously have occult power, but you haven't yet dreamed of the great occult power of the Buddha Dharma." The magician returened to India and told his followers, "I went to China to find Manjusri, and instead I found Little Shakyamuni." He is trying to deceive the whole assembly. a forest of saints stretches away to his right. The ranks of the saints serene, he sits to their right. To be appointed and not give way, strike the sounding post. a liver capacious as a peck or a bushel. Heart as big as a bushel. a clam's guts make a pearl. Clam guts open in pearls. Sleep-talking -- who knows my activity leaks away? Much talk -- who knows it leaks one's potential? Those with splendid eyebrows should laugh at family skeletons so presented. Shaggy eyebrows -- laughable, they reveal the family disgrace. Master Mazu and his disciples stopped using medicine for illness. Mazu, father and sons, in sickness stopped doctoring. How is it possible to get beyond all propositions and denials? What need would there have been to strike the gavel in the hall? It's not that he doesn't understand the meaning according to the words, but if there were an adept in Maitreya's assembly, as soon as he saw Yangshan say, "The teaching of the Mahayana...," he'd immediately tell him to shut up, no only stopping Yangshan's sleep talk, but also avoiding making people later on talk of a dram in a dream. Yangshan could dream that he went to the Tusita Heaven and was led in to sit at the third seat because that was his seat, just below Maitreya and Shakyamuni. He had matured to that level. I think the old teachers must have recongnized Yangshan's dream was a makyo, going beyond promise and presenting the essential world itself. There, in the presence of the Buddhas, Yangshan confidently arose, struck the stand with a gavel, and said, "The truth of the Mhayana is beyond the Four Propositions and transcends the Hundred Negations. Listen, listen." The Four Propositions are the one, the many, being, and nonbeing. The Hundred Negations are made up with four negatives for each of the propositions -- not, not not, neither not nor not not, both not and not not -- making sixteen. Then each of these sixteen is found in the past, present, and future. That makes forty-eight. These have either appeared or have not yet appeared, so that makes ninety-six. Negate the original four and you get the Hundred Negations. The truth of the Mahayana has nothing whatever to do with such intellection. It is found, as the Budha pointed out in the beginning, beyond the realm of words. Yet even with the word "beyond" perhaps some kind of image appears. Yangshan ends with a cautionary, "Listen! Listen!" Pay attention! Who is hearing that sound? Don't neglect this point. 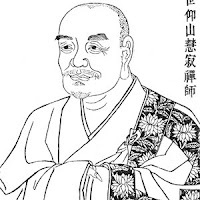 Yangshan stated the timeless liberative teaching of Buddhism that universal absolute truth is beyond all categories of human thought. Then he closed by once again calling forth presence of mind. We do not wake up from a dream, but rather we wake up to the dream. Some, hearing that the world is a dream, assent to it intellectually but at the same time secretly think of it as a poetic way of talking. They believe the dream is real, and this is the deepest dream of all. The four propositions are the world is separate from me, the world is not separate from me, the world both is and is not separate from me, and the world neither is nor is not separate from me. The hundred negations are permutations of these four. In other words, is the Mahayana truth beyond the real world as we know it? Yangshan's dream was simply the realization of the Zen saying, "With holy ones, dreams and wakefulness make one and the same stream." And enlightened mind is always in playful samadhi, in which medicine and sickness cure each other, and ego is each moment nuetralized and melted away, leaving behind no vexations and frustrations to be discharged in dreams. Yangshan's dream was his everyday life, and his daily task was nothing but his dream. He recognized himself seated in the third seat in the abode of Maitreya. Yangshan hit the podium with the gavel and spoke. He is not only telling what the Mhayana teaching is, but also showing it to everyone openly in broad daylight. Some say that the scriptures written in Pali are Theravada teachings and those in Sanskrit are Mahayana teachings. Our Yangshan would laugh at such statements. If you open your own third eye, you can read the whole of the Mahayana teachings in a glace at the blue sky, but if you close yourself off from your inner wisdom, both the scriptures written in Sanskrit and in Pali are nothing but papers smeared with nonsense. As Wumen said, the key point of this story is: "Did Yangshan really give a talk or not? If he did, what kind of a talk was it?" Students must concentrate their efforts to open their Zen eye on this point. The rest, whether a dream or a reality, is an outer setting for the story and not important. If you say he did not give a talk, why then did he demand of the audience, "Listen carefully"? The essence of this koan lies here, and students must concentrate their efforts in training to see through this point. How is the Reality of the Dharma of Mahayana itself demonstrated? Did Yangshan thoroughly illustrate it in his striking the table with the gavel? When you can truly appreciate this talk, you will also understand why Wumen said that Yangshan deceived all the audience. In this case, Mu, zazen, standing up, sitting down, eating, drinking, Jack, Mary, and so forth appear on stage under the name of dream. We should know that not only are our delusions and the phenomenal world dreams, but also our enlightenment and the essential world itself are nothing but dreams. The fact of today will be dram tomorrow. Minute by minute, second by second, everything previous to right now is a dream. And, of course, now is a dream too. Yangshan stood up and struck the stand with the gavel, WHACK! "The Dharma of Mahayana is beyond all thought and expression!" More precisely he was saying, "WHACK!" Just this! What is the Dharma of Mahayana? Just WHACK! Just standing up and sitting down, laughing or crying. He says that the Dharma of the Mahayana transcends the four propositions and the hundred negations. The true fact is completely beyond all thinking. Then he strikes the gavel. “Clack!” That “clack!” itself is the Dharma of the Mahayana. To cry out “Katsu!” like Linji or stick up a finger like Jinhua Juzhi is the same thing. Whatever you bring up from the phenomenal world, that itself is the Dharma of the Mahayana. It is itself the essential world. When there is no distinction between dream and the waking state, then perfect meditation is realized. Everything we see, think, and feel, in our self-grasping ignorance, is a dream. But if everything we experience is a dream, whet then is real? To say everything is real is delusion, to say nothing is real misses it. We exist -- but not in the way we think. Going beyond all words, how would you declare it? How can I be your student? how am I your student? Was it the second or the third seat? Did he bang the gavel first, or not? Anyway, I took that gavel and banged it. I had some point to make that seemed important. Or I'd already made it. I wanted the class to get it. Something about propositions and negations and beyond.